Kristy readily admits to not being a professionally trained chef, but that hardly matters when you examine her recipes. Her Nevada Foodies website obviously displays a passion for food, with the emphasis on wild game as the backbone to her menu suggestions. Kristy’s elk sliders with pancetta bacon and smoked mozzarella tell you something about her taste and imagination. These sliders are outrageously tasty. No dieting here unless you eat half your usual amount. However, we seriously doubt you can do that after the first bite! 1. In a large bowl, add mustard, bread crumbs, egg, garlic powder, and salt and pepper to ground elk meat. Mix all ingredients by hand and then form into small patties. Use a ¼ cup measuring cup to size how much meat to use when forming your patties. Place meat on tinfoil and press gently with your thumb, creating a small indent in the center. This will help keep patties from shrinking when cooking. 2. Pre-heat the grill to high temperature. 3. I recommend leaving the elk burgers on the tinfoil while cooking on the grill. The elk meat is very lean and can have the tendency to dry out if overcooked. Cooking on tinfoil reduces the risk of overcooking. 4. Cook 7 minutes or until brown, and then flip patties. Continue cooking on other side until brown (about 7 minutes). Add smoked mozzarella cheese to the top of burgers during the last 2 minutes of cooking. Close lid and melt cheese. 5. While cooking the burgers, place pancetta bacon slices on tinfoil and place on the grill for the last few minutes of cooking. Toast buns on grill. 6. 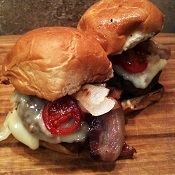 Place elk sliders on Hawaiian sweet rolls, top with a slice of pancetta bacon and a few cherry tomatoes, and you are set! Enjoy! The perfect adult beverage to accompany this perfect dish? 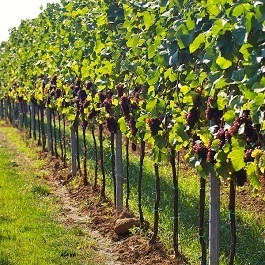 Rutting Ridge Cabernet Sauvignon, of course!